If you’re trying to figure out how to organize a small bedroom on a budget, these 12 ingenious tips and tricks will get you there in no time! I’ve never had the luxury of having a huge bedroom and even now, despite the 2,800 sq. ft home we live in, our master bedroom is on the small side and definitely lacking in the organizational department. Of course, just because your bedroom is small, doesn’t mean there isn’t plenty of space to utilize in order to get organized. Sometimes you have to get a little creative and even more so when you need to do it on a budget. If you’re starting from scratch with a bedroom makeover, definitely take all of these storage ideas into consideration, too! Add shelves to the walls – when you don’t have floor space, think vertical! Whatever size closet you have, you need to make the most of it and that means that one measly hanging rail won’t cut it. My favorite clothing storage solution is the IKEA Algot System. It’s incredibly easy to install and is completely customizable to your space and needs (see it at work in our closet here). Looking For More Home Organization Ideas? I like to have lots of baskets and shelves so that’s what I mostly added to my closet as that helped me coral my shoes, bags and dozens of pairs of jeans. As “custom” closet solutions go, these IKEA systems are pretty cheap too. 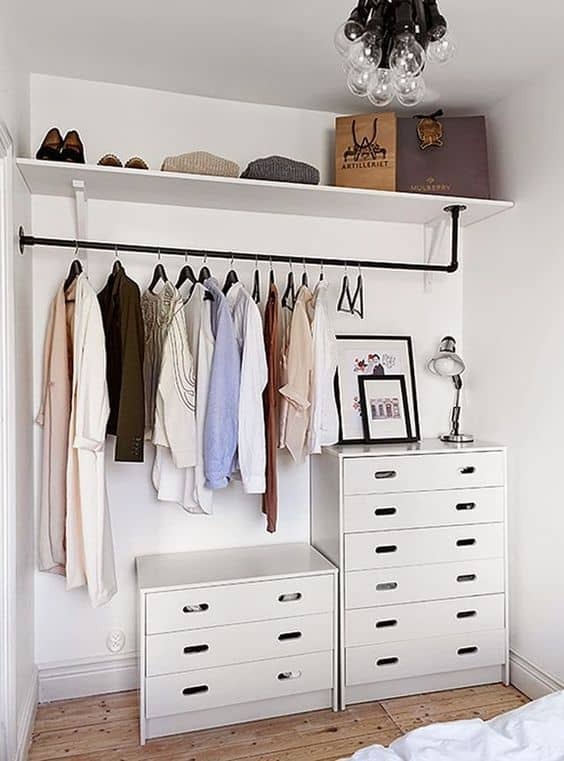 You can add as much or as little as you need and completely tailor whether you have a small or large bedroom closet, or small or large budget! Looking for More Organization Ideas For The Home? If your closet isn’t big enough for a system like this but you find you have a lot of wasted space inside, another great idea is to add your own shelving. This is an easy DIY storage idea to utilize wasted space . Plus, it’s super budget friendly. 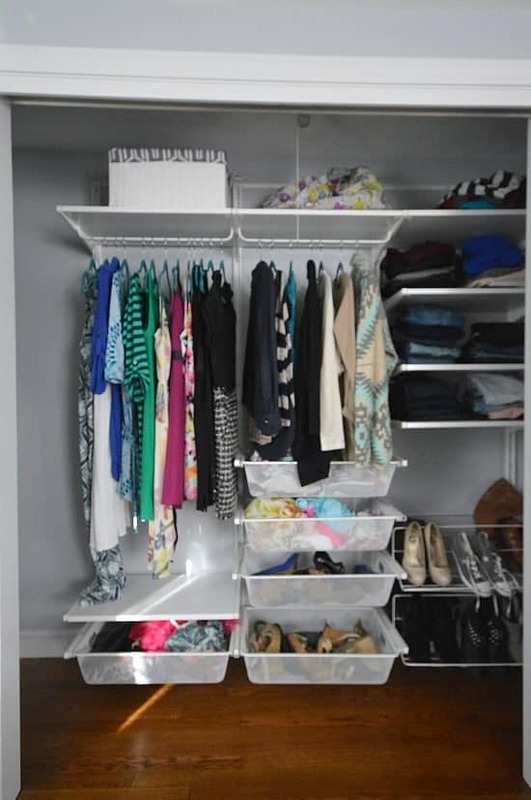 We’ve done this to all the smaller closets in our home and it has added a crazy amount of extra storage space. It’s a quick and inexpensive DIY project that will only take an hour or so, even for a newbie! Again, it’s all about utilizing every last inch of space when you have a small bedroom! Using felt hangers (like these) is another favorite closet organization tip of mine. Unlike plastic or wire hangers, felt ones don’t allow your clothes to slip off. And because they are slimmer, you can hang more. They also come in a rainbow of colors, so they just look a whole lot prettier! If You Don’t Have a Closet, Make One! Every organized bedroom has a closet. 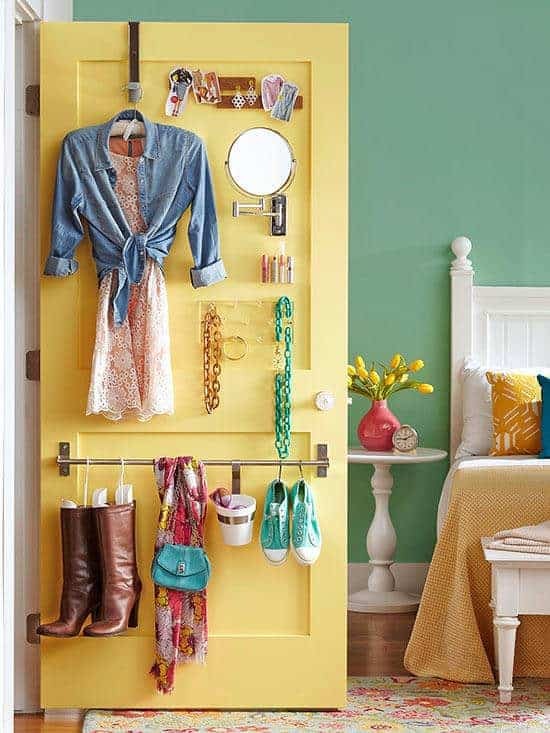 If your bedroom doesn’t have a closet, all you have to do is make one! If you’ve got an empty wall or nook, create your own closet space like this one above. You could even run the piping down from the ceiling you had to! Dresser drawer organizers are such a simple way to keep those drawers full of socks, underwear and all your other stuff under control. No one wants a bedroom where your undergarments are falling out of the drawers, stuffed in drawers or worse yet, hanging out of drawers! If your bedroom is without a closet, this becomes even more important as you need to get as much storage out of your drawers as possible. I really like these ones in particular because they are adjustable. Take note of how the items are folded above and not just thrown in. Folding is important! If you’re still short on space when it comes to your dresser, don’t forget to rotate items out seasonally. You don’t need all your heavy winter sweaters folded neatly and taking up space in those drawers when you could really use the space for t-shirts and summer tops. And on the topic of “folded neatly”, folding your clothes using the KonMari method or “vertical folding”, you will increase your drawer storage space by up to 50% while finding that it’s easier to grab what you want without disturbing all the other clothes in your drawers. Master Bedroom Reveal via Jenna Sue Design Co. Instead of traditional nightstands and table lamps, attach rectangular woven baskets (or crates or even wire baskets) to the wall to house your bedside necessities and install sconces on the wall. It’s budget friendly and works like a charm and you won’t have to worry about all the clutter that comes along with having a big nightstand to begin with. Using baskets as an alternative to a traditional nightstand via Jenna Sue Design Co.
Have a platform bed or a bed that has at least some open space underneath it? Then utilize it! 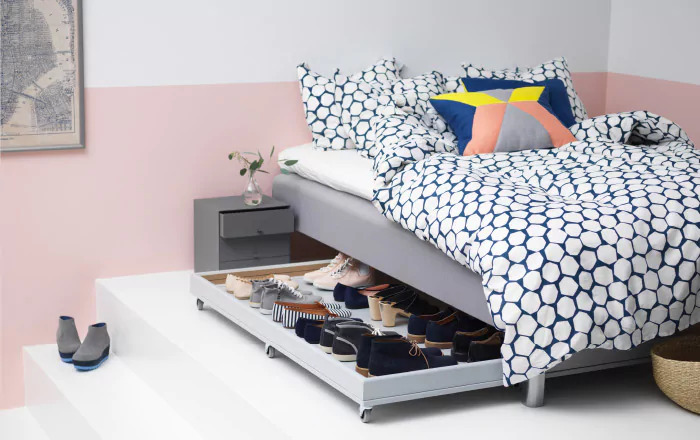 This shoe storage hack from IKEA is genius. Using a cabinet door with some casters added to it, you have instant shoe storage. Of course you could use old drawers or even plastic bins. By not limiting yourself to floor space, you will gain a lot more organizational and storage areas. The point? Don’t forget that there’s extra storage under that bed and it’s a budget-friendly way to gain extra space! Don’t Forget The Space Behind Your Door, Too! Think outside the box! Behind your closet door or even your bedroom door is a great spot for hanging a mirror, jewelry and scarves. Get the most of the space by hanging a bar, a pull-out mirror and some hooks. Adding shelves to your small bedroom’s walls is a fairly inexpensive and very easy way to add more storage and get organized. By going up, even the smallest bedroom can gain a lot more storage space. You can purchase wood at your local hardwood store and have them cut it to size, then simply attach to some wall brackets and hang it up. 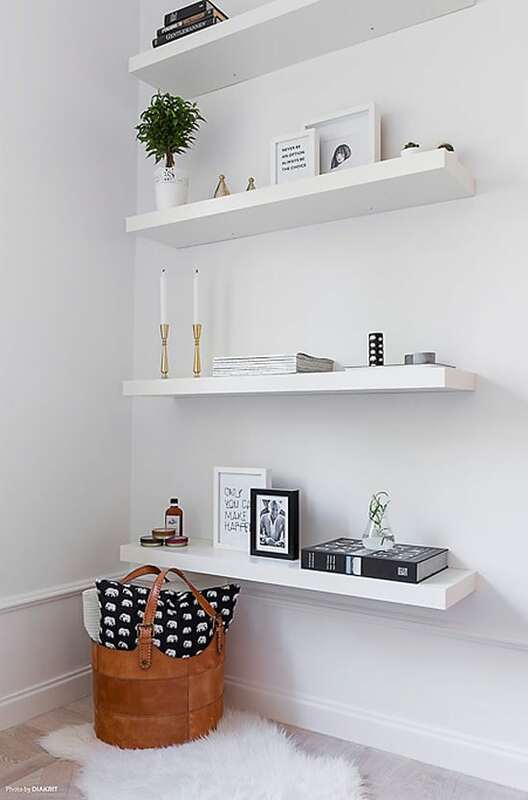 IKEA sells beautiful floating shelves as well as shelves with brackets that are also budget-friendly and easy to install. These rustic shelves that we had in our son’s nursery are just made from pine from the hardware store that was cut and stained and then hung on the wall using IKEA’s Ekby Bjarnum brackets, which you could spray paint any color to match your space. Finally, instead of leaving extra pillows and blankets on a chair on on your bed, roll up the blankets and place in a large basket along with any extra pillows. Not only does it look cute but it keeps them nicely organized and tidy. Are you ready to start organizing your bedroom? With these budget friendly hack and tips, you’re going to have a neat and tidy space in no time at all! Have another tip that I didn’t mention? I’d love if you shared it in the comments below!